We’re going to answer an important question today concerning a topic that gets a lot of attention in the world of alternative medicine: Can urine pH, as measured by a dip stick, be used as an accurate indicator of overall body pH? And more importantly, can you alter the body’s pH to a meaningful degree based on the foods you eat? I intend to answer these questions and more as well as provide a detailed physiological explanation to back up my position. Unfortunately, most of the arguments attempting to dispute these claims fail to adequately explain the mechanisms involved in pH regulation. Let’s begin by defining pH and what it means. Potential of hydrogen (aka pH) refers to the amount of hydrogen ions present in a solution. It measures on an inverse logarithmic scale from 0-14. A pH of 7 is considered neutral, below 7 is considered acidic, and above 7 is considered alkaline. So, the more hydrogen ions in solution, the lower the pH. This will be important to understand for the content contained later in this article as the body has several mechanisms it utilizes to maintain a strict blood pH of 7.38-7.45. It is true the foods we eat can in fact change the pH of our urine. Every food leaves behind an acid or alkaline ash. The relative acidity or alkalinity is determined by the amount of acid-forming constituents in the food such as sulfur and phosphate, or alkalis such as calcium, magnesium, and potassium. These will change the amount of hydrogen ions the kidneys need to dispose of, and thus will have an effect of the pH of the urine. The theory goes if we consume a diet rich in alkaline-forming foods such as fruits and vegetables, as opposed to acid-forming foods like animal products and grains, then this will beneficially affect the pH of the body. Before we proceed any further, I think it’s important to answer the question: Is alkaline always better? Proponents of an Alkaline Diet argue that as we become more acidic (based on our urine pH), we become more susceptible to infection and disease. Is this true, though? Does having alkaline urine necessarily indicate greater overall health? Let’s look at a few examples to determine whether or not we should hop on the alkaline bandwagon. First, let’s talk about the stomach. Do we want our stomach to be alkaline? The clear answer is no. Without sufficient stomach acid, it would be nearly impossible to adequately digest protein and absorb nutrients from our food. This is a pretty big deal considering protein is an essential building block of life. Not to mention, the less acidic our chyme (food + digestive juices) is, the slower our stomach will empty (allowing the potential of fermentation and putrefaction to take place via microbes), and the less pancreatic enzymes and bile that will be released to perform the second stage of digestion. This is precisely why you should never drink with meals, because it dilutes the acidity in the stomach necessary to digest protein, ionize minerals (preparing them for absorption), and kill pathogens such as bacteria or parasites lingering on our food. In terms of digestion, alkaline water is an especially bad choice, as its pH is sometimes thousands of times more alkaline than stomach acid, making your stomach work overtime to digest your food. When this acidic process is compromised we set ourselves up for a host of nutritional deficiencies and intestinal infections. This is one of the reasons I’m so strongly against the use of pharmaceutical proton pump inhibitors (PPI’s) to ‘treat’ acid reflux. The inevitable negative long-term effects that will eventually result from chronic use of these medications far outweigh the perceived benefits. What about the intestines? Well it turns out these tissues also benefit from maintaining a slightly acidic pH. This is why our guts contain a wide variety of acid-forming bacteria that help to create an unfavorable environment for pathogenic organisms. Many of the harmful bacteria and fungi we encounter typically tend to thrive at a pH that is more alkaline than the normal pH of the intestines. So, does urine pH tell us anything useful? Yes and no. It certainly can tell us that our kidneys are functioning, but making any assumptions beyond that are simply unfounded and have no scientific basis upon which to stand. Allow me to explain why. As I eluded to earlier, the pH of the blood and most tissues in the body must be maintained within a tight window of 7.38-7.45. If pH drifts too far outside of that window, enzymatic activity is altered. This is significant as nearly every reaction that takes place within our body requires an enzyme, so stepping outside of that window too much can lead to all sorts of physiological malfunctions. In severe cases, it can even be fatal. The protein buffering system in which the terminal ends, or R-group, of amino acids can either accept or release hydrogen ions to regulate the overall concentration. This system is utilized in both the blood plasma and inside cells. The protein hemoglobin, which is the oxygen-carrying component of red blood cells, is a good example of a common protein buffer. The phosphate buffering system in which phosphate ions (PO43-) can combine with hydrogen ions (primarily within cells) to form either hydrogen phosphate (HPO42-) which is a weak base or dihydrogen phosphate (H2PO4–) which is a weak acid. This is the main system used to buffer metabolic acids since there is a relative abundance of phosphate ions present in intracellular fluid. The bicarbonate buffering system in which bicarbonate ions (HCO3–) combine with hydrogen ions (H+) to form carbonic acid (H2CO3) which is a weak acid. Carbonic acid (H2CO3) can then be turned back into carbon dioxide (CO2) and water (H2O). Carbonic acid (H2CO3–) can also combine with hydroxide ions (OH–) which are extremely basic (alkaline) and form bicarbonate (HCO3–) and water (H2O). This is the most important buffering system present in the blood and other extracellular fluids. The main difference then, is how we dispose of these two categories of acids. Fixed acids, or metabolic acids, are tightly regulated by the kidneys. When we take in acids from our food, or generate acids from our metabolism, the kidneys respond by eliminating excess acids (H+) and reabsorbing bicarbonate ions (HCO3–) along the entire length of the nephron tubules. If this is still insufficient in dealing with the net acid load, we have another mechanism by which we can alter the concentration of acids and bases. Each nephron collecting duct is equipped with two different types of specialized cells: type-A intercalated cells and type-B intercalated cells. 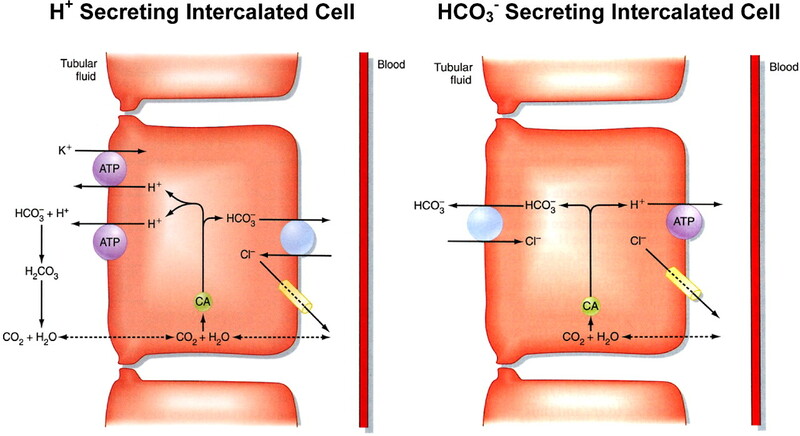 Both of these cells types have the ability to take water and carbon dioxide and use them to synthesize hydrogen and bicarbonate ions (via the zinc-dependent carbonic anhydrase). If we consume a diet rich in acid-forming foods, type-A intercalated cells will synthesize and excrete hydrogen ions into the urine while reabsorbing bicarbonate back into the blood. Conversely, if we consume a diet rich in alkaline-forming foods, type-B intercalated cells will synthesize and excrete bicarbonate ions into the urine and reabsorb hydrogen ions back into the blood. So no matter what our dietary input is in terms of acid or alkaline, our bodies will fight to keep our physiologic pH within the window of 7.38-7.45. Volatile acids are disposed of in a different fashion. We can see from the equation above that as the amount of carbon dioxide increases, the amount of carbonic acid and thus hydrogen ions also increase. Therefore, the more carbon dioxide we have present in our blood, the more acidic the pH of our blood will be. So in order to regulate the amount of carbon dioxide in the blood, humans have devised an ingenious mechanism: it’s called breathing. Breathing is a two-stroke process: we breathe in to take in oxygen, and we breathe out to get rid of carbon dioxide. Therefore, we can adjust respiratory (breathing) rate to compensate for changes in pH. Increasing respiratory rate increases the amount of CO2 exhaled, effectively increasing the body’s pH (more alkaline). Likewise, decreasing respiratory rate decreases the amount of CO2 exhaled and thus increases the amount of CO2 retained within the blood, causing a decrease in pH (more acidic). The respiratory system can compensate rather rapidly in cases of low-to-moderate changes in pH. The kidneys then adjust over the next hours and days in response to changes in levels of metabolic wastes. There are some instances where this system is insufficient at compensating for large pH swings, such as when diabetics enter into metabolic acidosis (in which the buildup of ketoacids result from the rapid conversion of fatty acids into energy when the body is starved of glucose), but this is a rare occurrence. The vast majority of the time, increasing ventilation (breathing) rate to get rid of extra carbon dioxide (and thus carbonic acid) can compensate for the increased acid load while the kidneys slowly take care of the rest. As you can see, regulation of pH is so vital for life that our body has many systems in place to keep it within a strict window. Therefore, it is virtually impossible to influence body pH to any significant degree, especially by means of dietary intervention. The body has complex metabolic checks and balances to maintain a tight pH window, and any extreme alterations cause the body to kick into overdrive to restore homeostasis. However, there is something to be said when it comes to the kidneys needing to chronically compensate for increased amounts of metabolic acids, such as in the case of someone on a long-term ketogenic diet (ketones are acidic) who doesn’t consume any vegetables, but we should not be overly-paranoid when it comes to consuming ‘acid-forming’ foods if we eat a balanced diet with plenty of fruits and vegetables. This doesn’t mean that it doesn’t matter what you eat, as there are plenty of other reasons to consume ‘alkaline-forming’ fruits and vegetables, but taking this idea to the extreme leads some people to believe they can achieve optimal health by drinking baking soda and alkaline water, which simply isn’t true. The main reason why people feel so much better when they switch to an ‘alkaline diet’ is because they increase their fruit and vegetable, and thus vitamin, mineral, fiber, water, and phytonutrient intake. These principles are the foundations of any health-promoting diet. However, I don’t believe that reasoning should be solely based on whether or not these foods affect our pH, as taken to the extreme can cause us to restrict foods that are healthy for us.